I will never say “no” to a classic BLT. But make it a Seared Scallop BLT and I will be the happiest girl in the world. 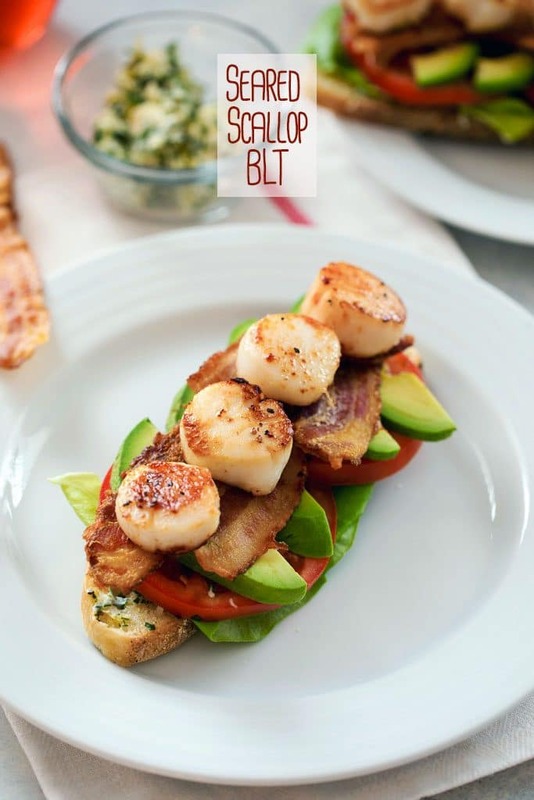 If you love the BLT sandwich, you need to try one topped with herbed butter, avocado, and simple seared scallops. Once upon a time, scallops were literally the stuff my nightmares were made of. When served for dinner, I would immediately feel horribly ill and cover my plate with a napkin willing the contents of it to disappear. Actually, my dry heaving would begin the moment my mom took the scallops out of the fridge and started the cooking process and I caught the scallop-y fragrance in the air. I’m really not sure what turned it around for me, but one day, I discovered that I actually liked scallops. And then? I realized that I LOVE scallops. To be totally honest, the smell of raw scallops still brings me right back to my childhood nightmares. But I’m able to push past it, give my scallops a beautiful sear, and enjoy some of the easiest and best dinners ever. Thank goodness because scallops have been crazy on-sale at my grocery store lately and I’ve been buying them every single time I go. I cannot stop and I will not stop. And then there are BLTs. If I see a BLT on a restaurant lunch menu, I will order it almost every time. Though they’re fairly simple, easy-to-make sandwiches, they’re a little more trouble than I generally want to go to at lunchtime. Mainly due to the bacon frying. But in warm weather, especially at the peak of tomato season, a homemade BLT for dinner is just what the doctor ordered. And if you want to make your BLT even more dinner worthy, seared scallops are the perfect finishing touch (though I will never turn down a lobster or salmon BLT either). Because I believe that every BLT should have its own special touch (and because I know far too many people who don’t like mayo), I made an herbed butter to use as a spread on the bread before layering on the scallop BLT ingredients. 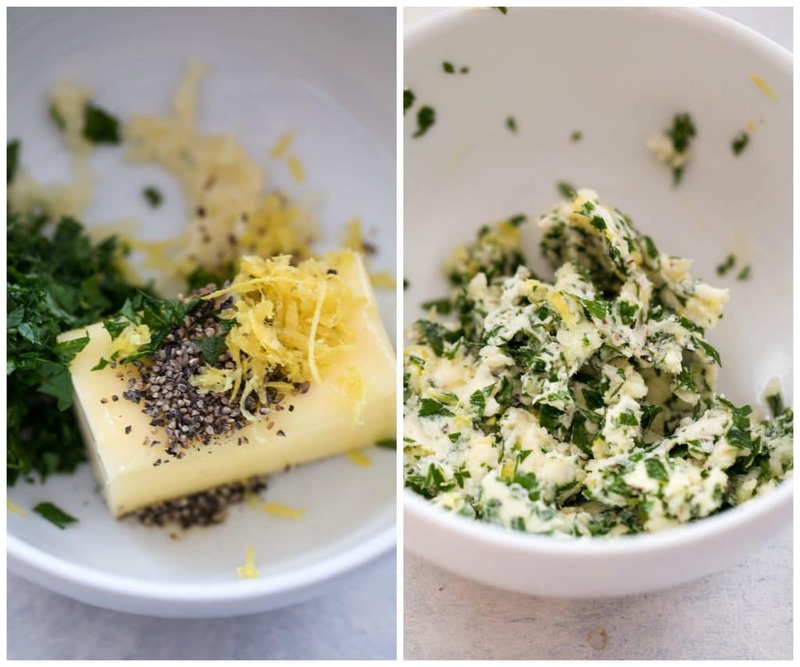 I don’t know why I don’t make my own butter spreads more often; you can really do anything with this so feel free to switch the herbs and citrus up if there’s something you prefer. One of the best things about scallops is how EASY they are to cook. I almost always sear them in a butter and olive oil mixture. Just for a couple minutes on each side until they’re nice and golden and caramelized. Once you sear the scallops and fry the bacon, the sandwich is ready to be assembled. I recommend toasting the bread. And then spread on the butter and top with lettuce, tomato, avocado (ALWAYS), bacon, and those beautiful seared scallops. Seriously (I just accidentally spelled seriously “SEARiously” in honor of the scallops), look at those scallops! 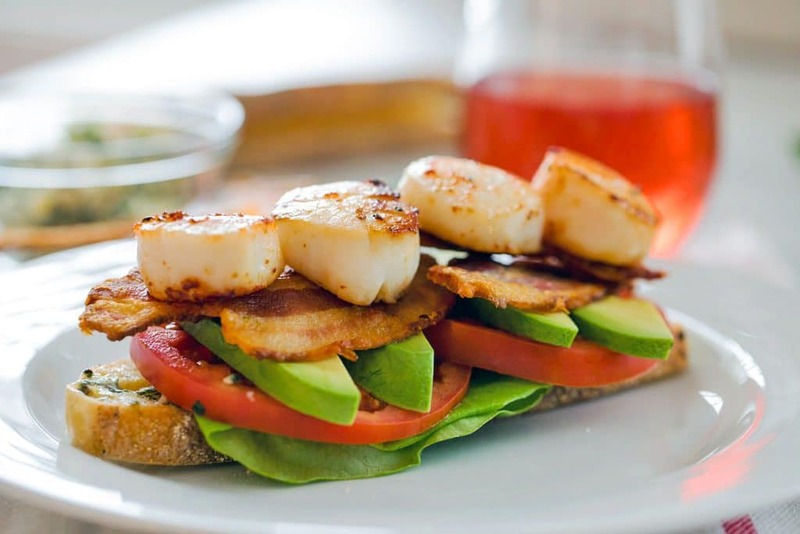 Seared scallop BLTs are the only BLTs you’re going to want after you try this sandwich. I hope I didn’t just ruin plain old BLTs for you forever. Don’t get me wrong; they’re still delicious. But scallops, man. How did I go so long hating them? This recipe serves four, with one open-faced sandwich per person. Considering there’s a lot loaded onto this slice of crispy bread, it’s a pretty healthy serving, but I will not blame you at all if you want two. You could also serve with some simple lightly dressed greens. Also, a warning that this scallop BLT is slightly difficult to eat. It’s loaded high and the bread is crispy so you may want to have a fork and knife on the side, just in case. I made it open-faced both for appearance and to make eating it a little bit easier. Plus, too much bread would cover up the flavor of the fabulous scallops. Also? Scallops and bacon together is my new idea of heaven. Yes, scallops went from the stuff nightmares are made of to what I imagine heaven to be like. If you’re trying to convince someone scallops are magical, you probably don’t want to start with serving them a scallop BLT as they’ll probably just be mad you tarnished their precious BLT. But maybe start by serving a few perfectly seared scallops over a bed of risotto with bacon and go from there. And if they don’t want them, bring those scallops to me and I will happily take care of them! What’s your favorite way to eat scallops? Lightly season scallops with salt and pepper. Add butter and olive oil to large pan over medium heat. 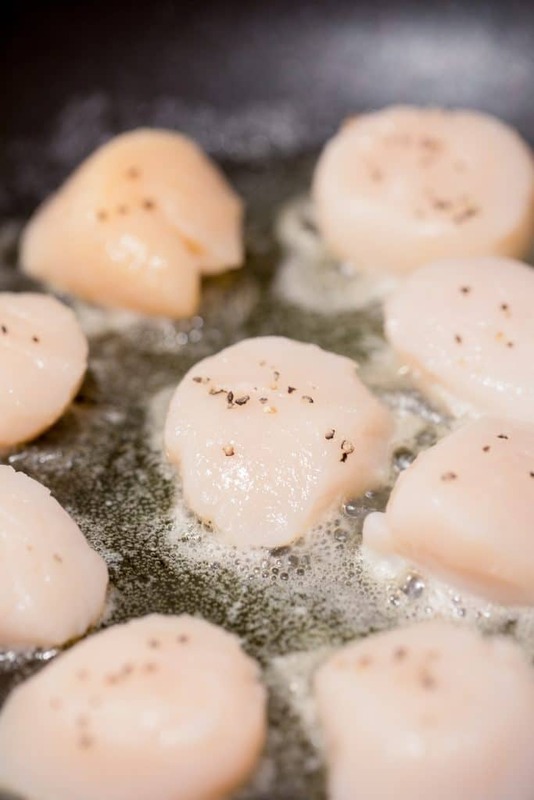 Once hot (but not smoking), add scallops in a single layer, taking care not to over-crowd them. Let sear for about 2 minutes before flipping and searing for another 1-2 minutes, until golden brown on both sides. Remove to a plate and tent with foil to keep warm while preparing the rest of the sandwich. 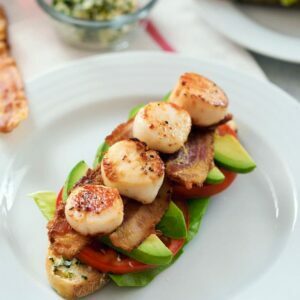 Spread herbed butter on four slices of crusty bread and top each with two leaves of lettuce, two slices of tomato, four avocado slices, two slices of crispy bacon, and four scallops. In a small bowl, combine all the ingredients and lightly beat with a fork to blend. 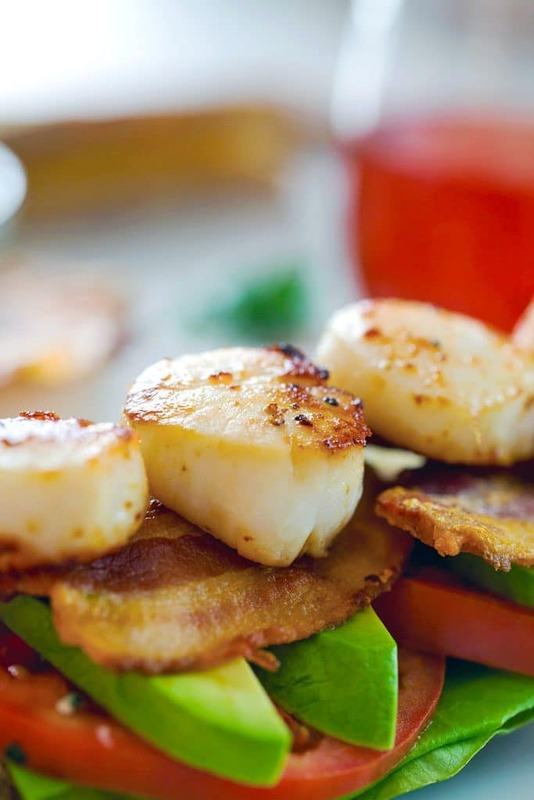 18 Responses to "Seared Scallop BLT"
I agree, everything is better with bacon and scallops??? Yes please! This looks totally awesome, for the record. Get in my belly. I kid. But seriously, BLT’s are the BEST, especially with good bacon and fresh bread. Mmm. ooh mmmmm. i love anything and everything with scallops. I agree Now that’s a good looking BLT. wow! Let’s have it at The Capital Grille! I absolutely love the deconstructed look of that sandwich. 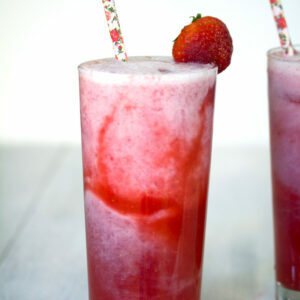 Lobster BLT’s are a favorite of mine and I bet these would be equally amazing. Bacon makes all things better. Scallops on a sandwich is out of this world! Scallops have been one of my most favorite things since I was a little girl! And nothing beats a perfectly seared scallop. I’d be all over this. Such a crazy tasty combo! I would have never thought to combine them but it totally works! YUM! I cannot eat from the sea, but these even look delicious to me! 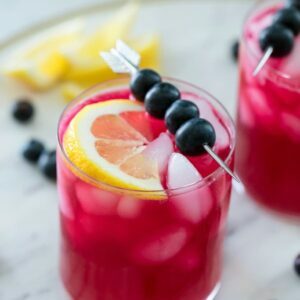 My husband might lose his mind over this recipe. I could eat it sans scallops (just BLT) and my husband could eat my portion! That is a gourmet BLT right there! I love scallops, and I enjoyed reading about your love for scallops. I am all for pushing the limits with seafood, and this sounds like a great idea. Can’t wait to try this – I love BLTS in the summer! Glad you were able to get past your scallops nightmare & make these lovely looking sandwiches. 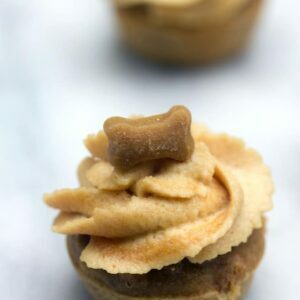 The butter spread on these sounds like a great idea! That cracked me up that scallops made you gag just by smelling them raw. I have one food that does that to me, but not scallops. I love scallops and always have. I would never have thought to make it into a sandwich! Brilliant! I can’t wait to try your recipe! My stomach just growled! I have a place nearby that brings in fresh scallops almost every day, and pick up some whenever I’m in that area. Now I know exactly what I’m going to make next time. This dish looks fantastic! My tummy is rumbling now :-)) Those scallops are so perfectly seared and tasty. 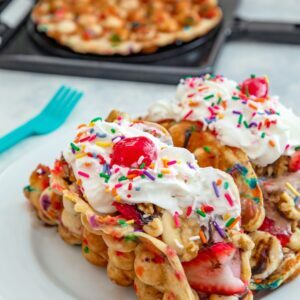 Talk about over the top good…what a tasty treat you’ve created.